Southwest Airlines announced Monday that it will introduce eight new nonstop routes for passengers traveling from Mineta San Jose International Airport starting in March 2018. Southwest's vice president-controller Leah Koontz announced the new routes during a news conference at the airport's B Terminal. The most noteworthy new route is a nonstop flight from San Jose to Cabo San Lucas, Southwest's first international service to the Mexican resort region and to the country from San Jose. That flight will be a Saturday-only flight starting March 10. The airport currently offers direct service to Cabo San Lucas via Alaska Airlines. The new domestic nonstop destinations announced were to Orlando, Florida; New Orleans; Houston; Albuquerque, New Mexico (Sunday only); St. Louis; Spokane, Washington; and Boise, Idaho. In addition to the nonstop routes, the airline will be adding 80 weekly flights to already existing service to Chicago-Midway; Dallas-Love Field; Phoenix; Portland, Oregon; and Seattle. "I extend my sincere gratitude to Southwest Airlines' CEO Gary Kelly and his executive team for their confidence and significant new investments in San Jose," Mayor Sam Liccardo said in a statement. "Southwest's decision to offer nonstop service to many new destinations and to add additional flights to existing destinations brings welcome news to business and leisure travelers throughout Silicon Valley." 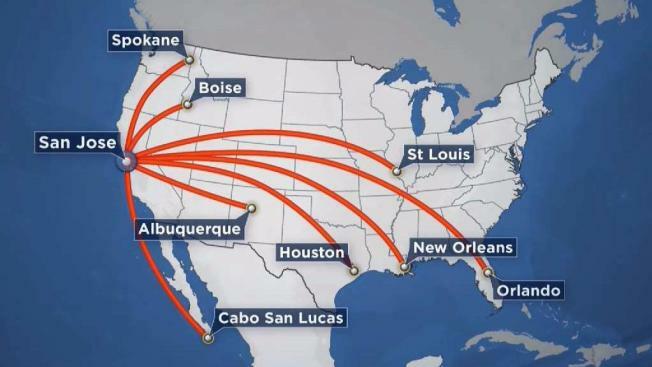 The new routes will bring the total number of Southwest nonstop routes from San Jose to 24 early next year. "This growth in San Jose is incredibly exciting as we expand our reach to even more cities across the United States, as well as into Mexico with the addition of Cabo San Lucas," Koontz said in a statement. The new routes start as early as March 8, with the latest routes starting April 8.